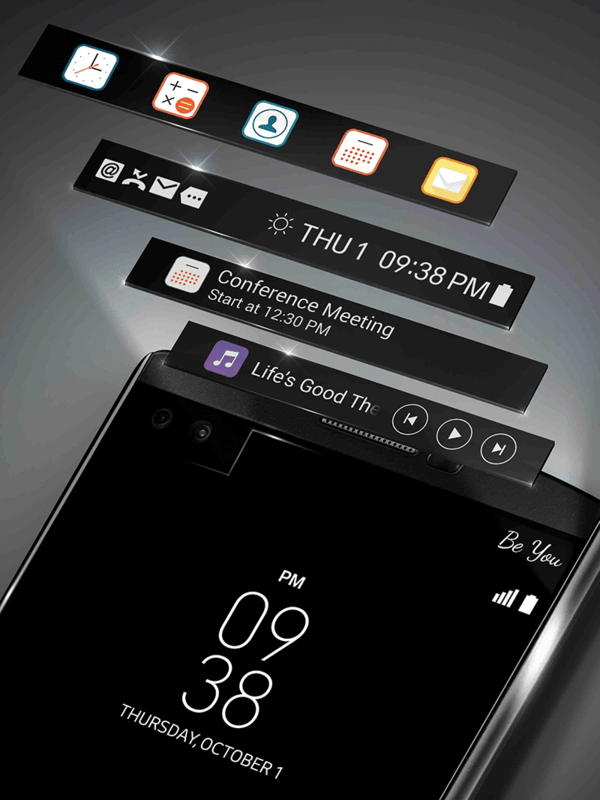 LG V10 Announced, Better Than G4 With Dual Selfie Cams And Second Screen! Home / best phone in the world / lg / lg v10 / lg v10 specs / mobile / news / LG V10 Announced, Better Than G4 With Dual Selfie Cams And Second Screen! LG Electronics, a world renowned leader in innovation strikes again. They just announced the LG V10, a weird smartphone with cool features like the dual selfie cameras, manual video mode and second screen. The best multimedia phone in the world today? There's a chance! It features a 5.7 inch QHD screen and a 2.1 inch QHD screen that performs as an always on companion that has the ability to show date, time, weather and battery when the main screen is off. The second screen also serves as a shortcut to your favorite apps when you turn on the main display. Under the hood, this is is a beastly phone on paper! It boast the hexa core powered 64 Bit Snapdragon 808 processor, has that huge 4 GB of RAM, 64 GB internal storage expandable via micro SD card up to 2 TB, 16 MP rear camera with manual mode for video, 5 MP dual camera in front, 3,000 mAh of battery, Android 5.1 Lollipop and LTE capable. That makes this phone one of the most feature packed devices in the world as of today, it's also more powerful than their current flagship called the LG G4. There's no price tag yet, but I'm expecting a hefty one here.